Received August 19th, 2010; revised October 25th, 2010; accepted November 3rd, 2010.
agement is hard to be saved into the knowledge repository on time. It may cause a knowledge distortion or even missing. 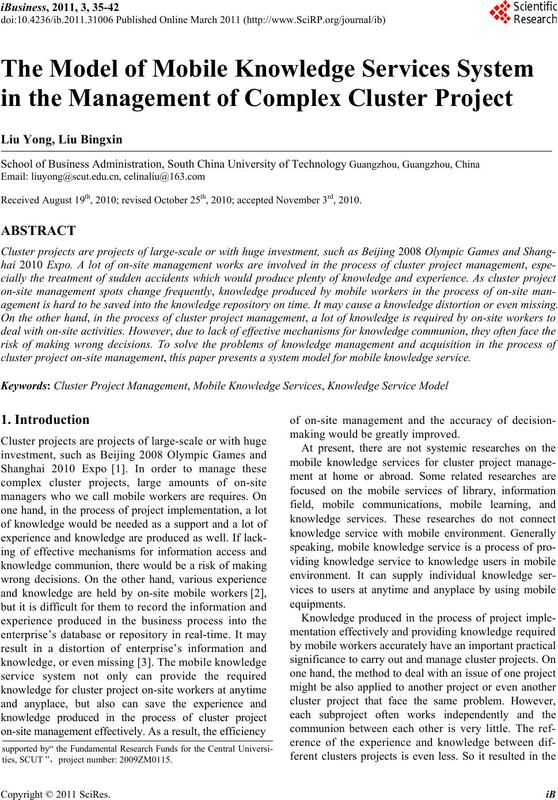 cluster project on-site management, this paper presents a system model for mobile knowledge service. making would be greatly improved. ties, SCUT ”，project number: 2009ZM0115. 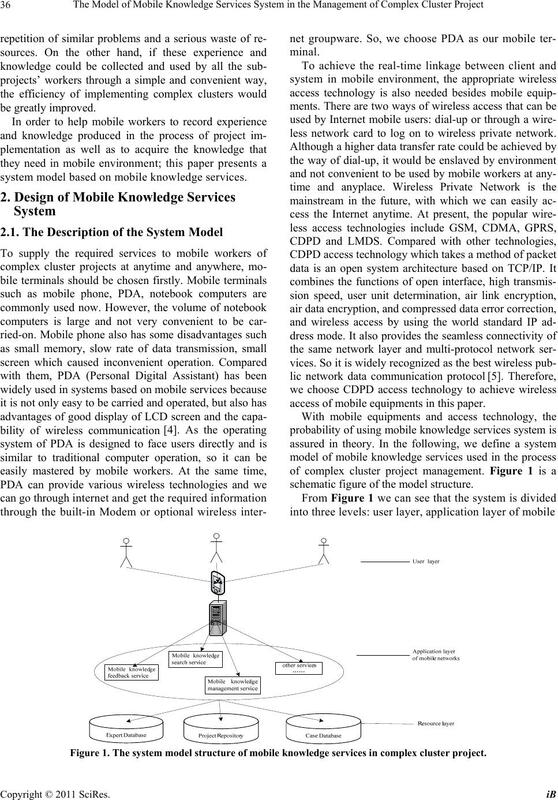 be greatly improve d .
system model based on mobile knowledge services. less network card to log on to wireless private network. 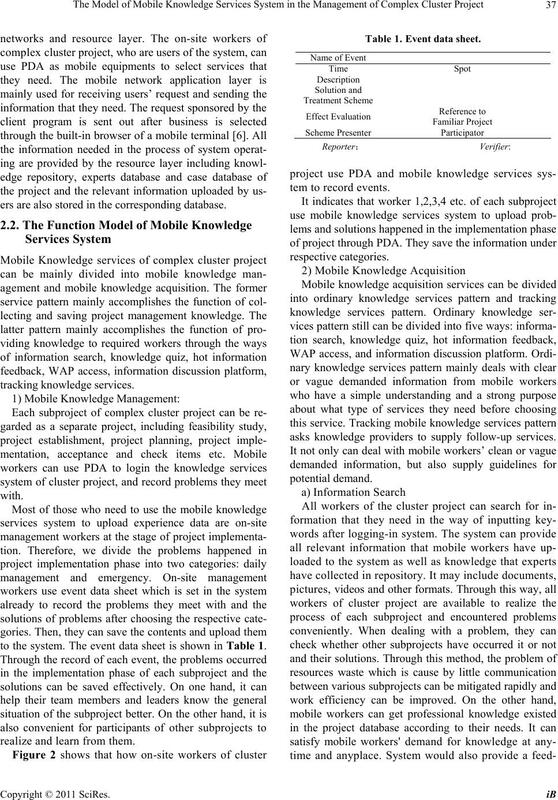 access of mobile equipments in this paper. schematic figure of the model structure. Figure 1. 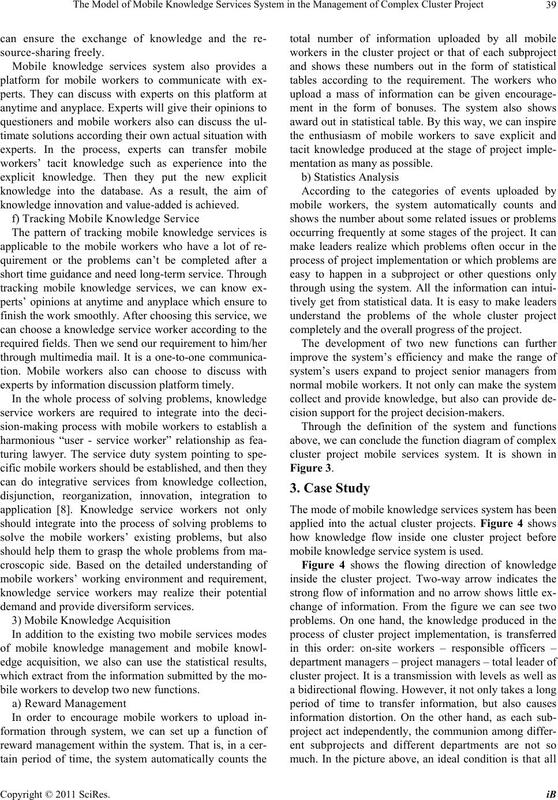 The system model structure of mobile knowledge services in complex cluster project. ers are also stored in the corresponding database. to the system. The event data sheet is shown in Table 1.
realize and learn from them. Ta bl e 1. Event data sheet. asks knowledge providers to supply follow-up services. Figure 2. The sketch map of uploading events by mobile workers by using system. put new solutions into the project database. form of multimedia mail through background processing. problems, the results would be saved in the database. So, the database can be enriched continuously. to the web page in order to achieve resource sharing. downloaded to update the web timely. knowledge innovation and value-added is achieved. experts by information discussion platform timely. demand and provide diversiform services. bile workers to develop two new functions. mentation as many as possible. completely and the overall progress of the project. cision support for the project decision-makers. 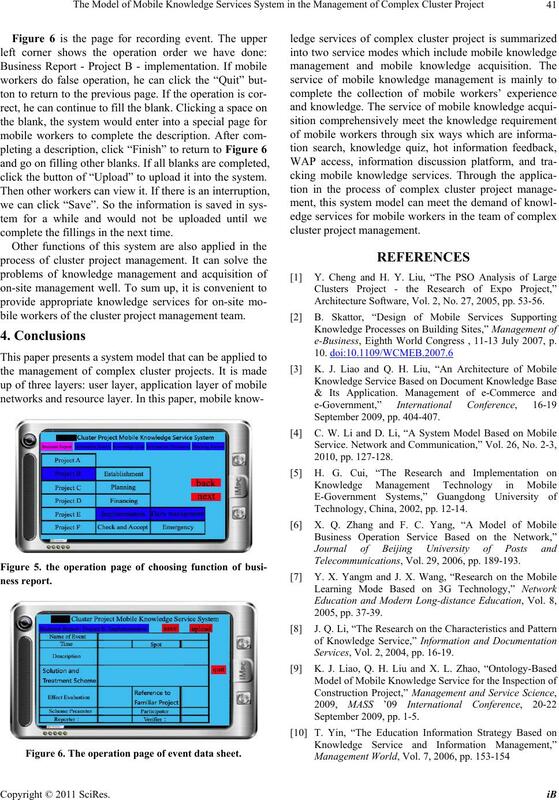 mobile knowledge service system is used. Figure 3. 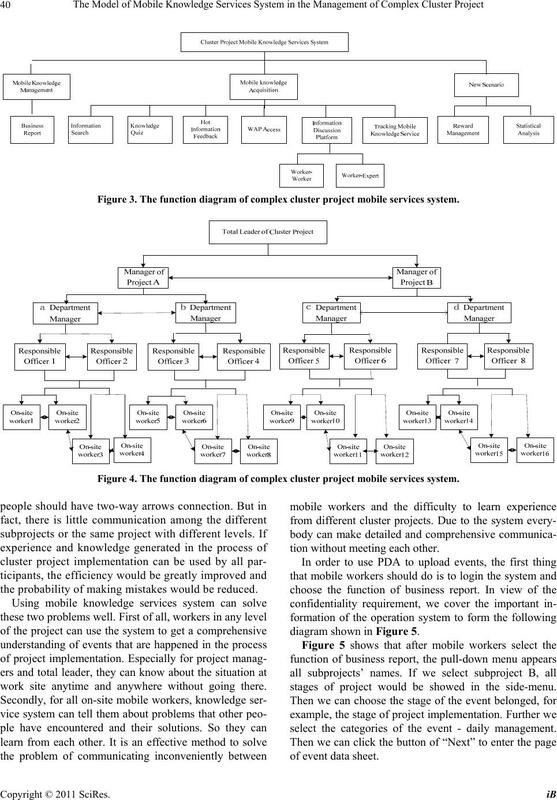 The function diagram of complex cluster project mobile services system. Figure 4. 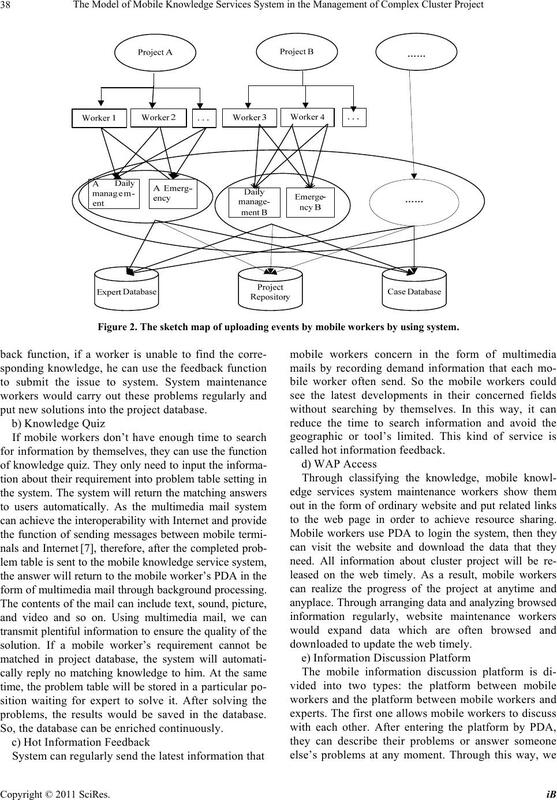 The function diagram of complex cluster project mobile services system. the probability of making mistakes would be reduced. work site anytime and anywhere without going there. tion without meeting each other. diagram shown in Figure 5.
stages of project would be showed in the side-menu. select the categories of the event - daily management. 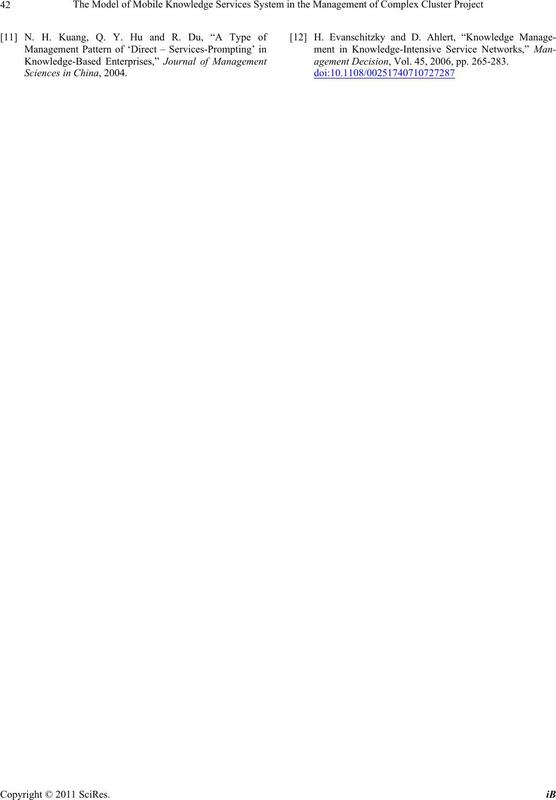 click the button of “Upload” to upload it into the system. complete the fillings in the next time. bile workers of the cluster project management team. Figure 6. The operation page of event data sheet. cluster project manageme nt . Architecture Software, Vol. 2, No. 27, 2005, pp. 53-56.
e-Business, Eighth World Congress , 11-13 July 2007, p.
Technology, China, 2002, pp. 12-14. Telecommunications, Vol. 29, 2006, pp. 189-193. Services, Vol. 2, 2004, pp. 16-19.
agement Decision, Vol. 45, 2006, pp. 265-283.